Spain has launched legal action against US marine explorers over a wreck they have found laden with treasure. The wreck has been described, speculatively, as a 17th Century vessel, found off the coast of England, containing $500m (£253m) in coins. However, there have also been rumours that it was found off Spain. 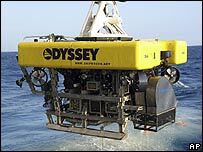 Odyssey Marine Exploration would only say it was found in the Atlantic Ocean. A lawyer said if the vessel was Spanish any treasure would belong to Spain. Jim Goold, of the law firm Covington & Burling, representing the Spanish government, told the BBC: "The lawsuit will challenge Odyssey Marine Explorers' right to recover or possess any property of the Kingdom of Spain recovered from sunken ships. "Odyssey has been requested to provide information concerning the identity of the ship and the material recovered, and has failed to respond." Odyssey would not make any further comment when contacted by BBC News. It has so far sent 17 tons of coins recovered from the wreck back to the US for examination. It says the discovery is the biggest of its kind. Mr Goold has represented the Kingdom of Spain over shipwreck cases before, involving the recovery of material from two ships, Juno and La Galga, in a 2000 court case. The Spanish government won the case. Mr Goold said the Spanish government had never abandoned its sunken ships. "Salvage operations without Spanish permission are not acceptable," he said. Spanish media have reported that Odyssey Marine Exploration vessels had been seen with flags denoting they were undertaking marine research in Spanish waters in recent months. Odyssey's co-founder Greg Stemm denied any wrongdoing in an interview with the El Pais newspaper last weekend, AFP news agency said. Spanish Culture Minister Carmen Calvo said on Tuesday the Spanish government was monitoring the case, AFP said. "If the discovery were made in Spanish waters, the firm would be guilty of plundering and undertaking contraband dealing in cultural goods," she was quoted as saying. Earlier reports suggested the wreck was found 40 miles from Land's End, in Cornwall, England. Shipwreck expert and historian Richard Larn said a Dartmouth-based ship called the Merchant Royal sank in that area in 1641. It was laden with bullion from Mexico and there had been speculation that this was the wreck salvaged by Odyssey. Odyssey said it had kept the location secret for security and legal reasons. "The gold coins are almost all dazzling mint state specimens," Odyssey co-founder Greg Stemm said. 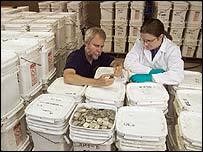 The artefacts, including more than 17 tons of silver coins plus a few hundred gold coins, have been shipped to the US and are being examined by experts at an undisclosed location. The mammoth haul was salvaged using a tethered underwater robot. Odyssey, which used the code name Black Swan for its operation, said it expected the wreck to become one of the "most publicised in history".